​​​ SAN ANTONIO – The San Antonio Independent School District voted to sell roughly five acres just south of Hemisfair for $14.5 million. The property was sold to Broadway SA Investors, the real estate arm of Silver Ventures, which redeveloped the Pearl Brewery. The four tracts being sold are located at 620 Matagorda St., 211 Lavaca St., 215 Lavaca St., and 141 Lavaca St., and are grouped into two lots with two different zoning designations. The first lot contains 0.79 acres and is zoned for residential-mixed use; the second contains 3.95 acres and is zoned for office use. 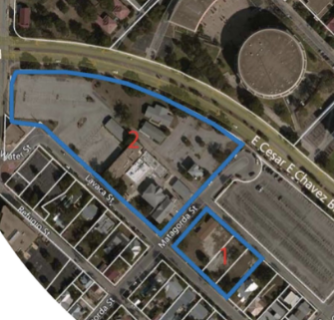 Both tracts, across the street from Hemisfair’s Yanaguana Garden, also have historic zoning requirements. Silver Ventures Managing Director of Real Estate Bill Shown said he isn’t yet sure exactly how the land will be used, but that it was attractive because of the “great, historic buildings” on the property.